During my community service yea r I spent almost the entire year doing paediatrics, which I absolutely loved. Once thing that surprised me during that year was the number of children that I saw with urinary tract infections. It was more common than I thought it would be, and in many situations the infection had progressed quite badly as the parents had been unsure about the serious nature of the complaints, or dismissed it as “tummy cramps”, which affected my children regularly, often related to constipation/dietary issues. Up to half of these children have an abnormality in the structure of their urinary tract, which would need to be investigated and/or managed further. UTI’s can extend up to the kidneys, causing what we call “pyelonephritis”. Speaking from experience, not only is pyelonephritis incredibly painful and makes you feel absolutely awful – often requiring admission for antibiotics through a drip, it can lead to scarring of the kidney when it heals which can lead to high blood pressure and even kidney failure if severe. In general, we are more concerned about the serious consequences of a UTI when it presents in a little boy. Little girls will get them more often as they have a shorter urinary pipe (urethra) which connects to the bladder. The shorter the pipe, the easier it is for bacteria to get to the bladder, and eventually kidneys. So, as a parent, what can you look out for? In small babies the symptoms are a lot more generalized – you may find they have a fever, and are very irritable, refusing to feed and not growing well. More concerning symptoms would be vomiting, jaundice, offensive urine and a seizure from the fever. As children get older it is easier to suspect a UTI as they will often complain that it burns when they go to the bathroom, or they need to go frequently. They may even report blood in the urine or bad smelling urine. Other things you may notice are that they don’t want to eat, are vomiting and generally unwell. A child who has previously been dry through the night may start wetting the bed again. Ok, so your child has these symptoms – what’s next? 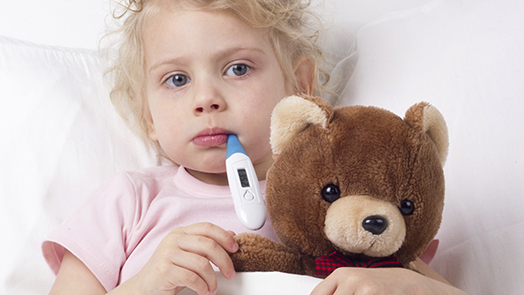 First things first – give them Panado, at an appropriate dose for their age, to help with fever and pain. Then bring them in to see a doctor. We will take a urine sample and do a “dipstick” test, which gives us an indication if there is infection or not. If there is an infection, we need to start antibiotics at the time, treating with a broad-spectrum antibiotic that covers the most likely bacteria. Our go-to antibiotic is usually Augmentin. In all cases we need to send a sample to the lab. They will examine the urine and see which bacteria grows. This way we can be sure that we are treating with the correct antibiotic. Some children may have a more complicated infection – we more commonly see this in little boys. Sometimes they may have to be admitted to hospital, especially if the infection has gone into the kidneys. In other cases they may be able to take antibiotics at home, but should return once they are better to for an ultrasound of the kidneys. Make sure they drink enough water, especially on hot summer days. Encourage your children to go the toilet when they feel the need. Children should not be encouraged to “hold it in”. I find this can be a problem in schools where children are sometimes too nervous to ask their teacher, or sometimes are refused y their teachers. Little girls should be taught to wipe from “front to back” to decrease contamination with faecal bacteria. Have a healthy gut. In general this just requires a healthy diet with few sweets and processed foods, but taking a lactobacillus supplement can be beneficial.